The first day of the season is always a tricky occasion. Quite apart from the trauma of worrying about the wind and how the birds will fly, there are all the little things to remember. Where, for example, did the champagne flutes get left? Have you bought enough coffee to dry out the bleary eyes of all the guns and guests? Where did that new pair of bootlaces get to? Wood Bank is one of the best drives on this shoot. Given all this, you might think that Amber and Tom Spilsbury were being somewhat brave when inviting a member of the shooting press to their first day of the season on the Cheveridge shoot. When you consider this was to be the first day in the shoot’s history, you might think them somewhat foolhardy. But this farming family are no strangers to running shoot days, since they have run the very fine Noverton pheasant shoot on their neighbouring farm for the last seven years. Headkeeper on the 400 acre Cheveridge shoot, Tom greeted me with a firm handshake and nary a quaver in his voice. He is either an excellent actor or a man of superhuman confidence. While Amber was away on the school run with their two young children, Tom explained a bit about the shoot. Like any farming family, Tom and his parents have identified a need to diversify their businesses. Though successful, growing traditional and modern cider apples on a contract with Magners, prize-winning hops and rearing numerous sheep, no farm in the 21st century can afford to rely on the products of their soil alone. 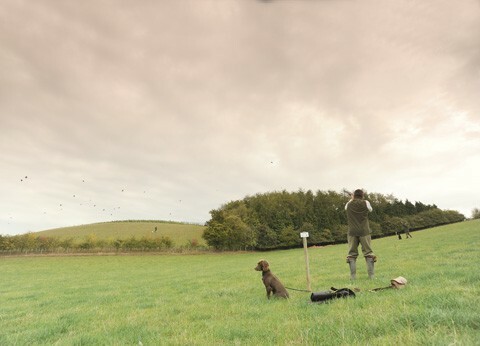 “We’ve been running a pheasant shoot at Noverton for the past seven years, and decided we wanted to get into partridge shooting too. “We have tried introducing partridge shooting in the past on the Noverton shoot, but because it is flooded with pheasants it just couldn’t work. Finding enough drives where you can shoot just partridge early in the season without seeing any pheasants is almost impossible. So we decided to take the partridge shooting to another farm and start a whole new shoot business. “We own most of the ground at the family farm but here we’ve been tenants for about 45 years. We were very lucky in that we got a long-term lease on Cheveridge Farm, where Amber and I live, which included all the sporting rights. 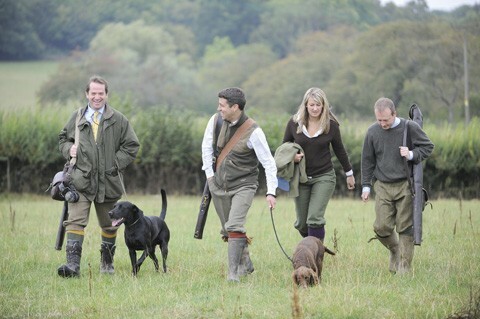 That was about seven years ago, when we first started the shoot at Noverton. Amber Spilsbury is a welcome presence on the peg, ensuring her guests are making the most of the day. “I’ve been doing all the keepering here with the partridge. I was full-time keeper for six years when we started at Noverton. Partridge do not require as much effort as pheasants: they were put down six weeks ago and they’re now at the stage where we can basically leave them to it. 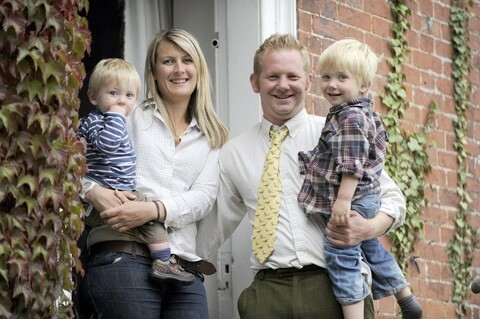 “We bought them at 14 weeks, and they were fantastic quality birds. We would usually rear the birds, but since this is Amber’s first foray into shooting we wanted to keep things nice and simple. We bought in 10,000 birds, giving us set costs and an easy budget to work from in our first year. Amber wanted to keep things relatively straightforward as we have two young boys who need plenty of looking after, so buying the birds in means we only needed to worry about the food, beaters and the rent. The Worcestershire land where the shoot makes its home is ideal shooting territory: rolling hills, patches of woodland and light soil underfoot. This mid-September day was dry and bright, only a lack of wind being a potential problem for Tom and his team of loyal local beaters. Good sport on Front Meadow. The drives have been carefully planned, coveys being driven from neat cover crops, predominantly maize, and woodland towards guns stationed well below. 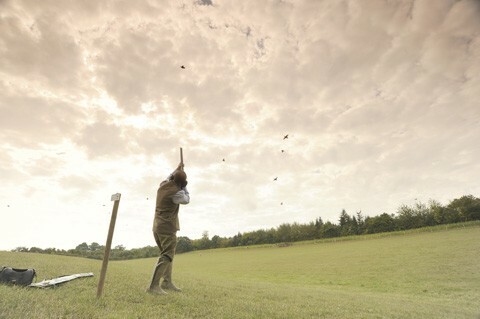 On a number of drives, banks of trees behind the guns force the birds up and over the line, providing some really challenging sport. Though the wind was unfortunately either not in evidence or seemingly against us on this day, all the guns saw some excellent birds on each of the drives. Amber and Tom had taken this day for themselves, inviting local friends and business colleagues as their group of guinea pigs. Guns will always find testing partridge shooting here. Although we were a disparate group, by the time coffee had been passed around all were smiling and indulging in tales from the shooting field, whether spectacular mornings on the marsh or in anticipation of the driven days ahead. Of course, all shooting men and women have a love of the sport which binds us together, and that seems reason enough that any group of guns should get on. We could put the good humour down to it being the first day of the season for most of us, but in fact it was the relaxed atmosphere created by Amber and Tom which enabled us all to get on. Both have enough experience of dealing with teams of guns to know how much they need to interject. Conversely they also know when it’s best to sit back and let the team take care of itself. Hospitality, like all good shoots, is high on the agenda here. A stop for elevenses brought the now obligatory (and delicious) sloegasms and lunch was light, bringing an array of sandwiches to keep us going along. An afternoon break brought out chilled beers, most welcome in the mid-September heat, and homemade fruitcake and tea greeted our return to the farm. Those who enjoy a proper feed on shoot day should fear not, however, as the evening brought a hearty meal prepared by Amber herself. Three courses and good wine brought a fitting end to the day. It was at the table that I got a feel for what really makes this a successful shoot. 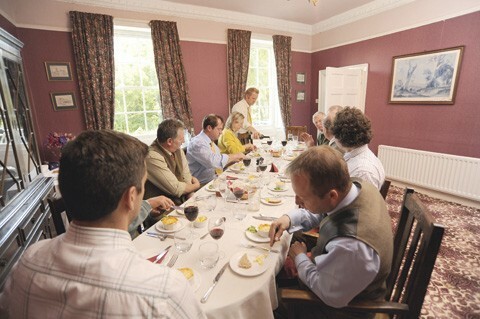 A fine supper around the dinner table makes for a fitting end to the day. As you might expect for the first day, some of the drives had worked better than others but all the guns had had some smashing shooting. My highlight was a lovely right-to-left crossing bird on the first drive after lunch, and that was just one of many birds that flew and fell for a second time that day as the evening wore on. Although it is early in the life of the Cheveridge shoot, Amber and Tom are already running days of exceptional quality. 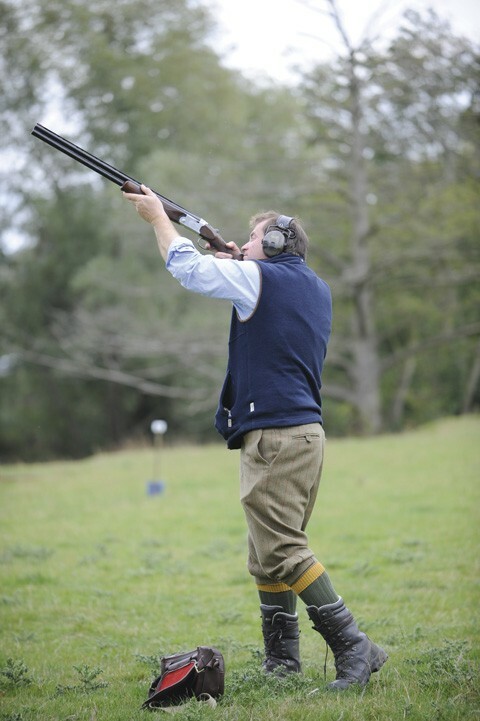 With their experience, generosity and well-presented, challenging sporting birds, the Cheveridge shoot is sure to go from strength to strength. For more information contact Tom or Amber Spilsbury on 01584 881 248 or 07966 294 032.